Shock and vibration rank among the most destructive agents in industrial environments. These disturbances erode the life of mechanical and electronic equipment – driving machinery from service long before necessary. Sometimes this premature deterioration stems from repeated overstress loadings, sometimes from fatigue failures of vital parts, and sometimes from a combination of both. Isotech offers a variety of wire rope isolators that resolve shock and vibration issues in virtually any application. 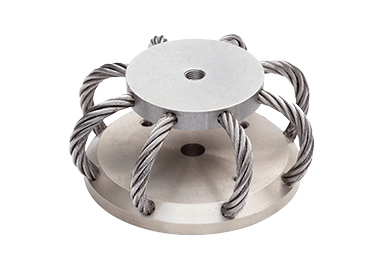 By selecting wire rope with the proper characteristics – wire diameter, number of strands, cable length, cable twist or lay, and the number of cables per section, we have created wire rope isolators that provide superior equipment protection. Ideally, passive isolation systems require no maintenance, use little space, and keep functioning under varying temperatures and in corrosive environments.